“India is the cradle of the human race, the birthplace of human speech, the mother of history, the grandmother of legend, and the great grandmother of tradition. Our most valuable and most instructive materials in the history of man are treasured up in India only” – Mark Twain. It is but unfortunate that many an Indian themselves are involved in looting her rich heritage for money! 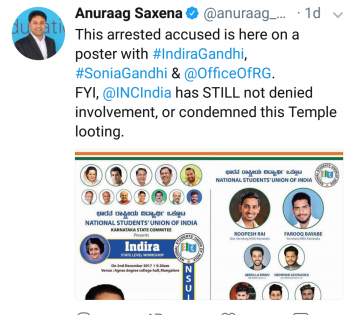 The recent surfacing of a heritage sale racket involving a youth Congress leader is a big blow to the nation. 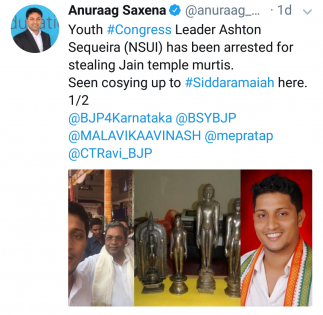 According to a Times of India report, Ashton Sequeira, ‘District secretary of NSUI, student wing of the Congress and four others have been arrested by Udupi District police for allegedly trying to sell antique bronze idols of Jain Tirthankara near Kotalingeshwara Temple in Kundapura, in Udupi’, Karnataka recently. 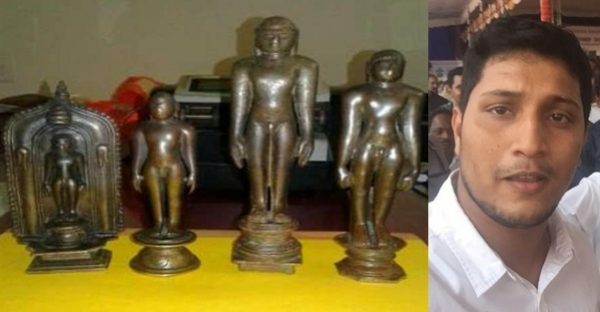 The value of the Jain idols, according to police, may run up to several crores of rupees. As per the Times of India report, the arrested were identified as ‘Nevill Wilfy Mascarenhas, 36, from Padil, Mangaluru, Anil Furtado, 34, resident of Talaguppa in Shivamogga district, Ashton Sequeira, 28, resident of Kulshekar, Mangaluru, John, 57 and his wife Anila, 45, resident of Church Road in Kundapur.’ Ashton Sequeira is the Dakshin Kannada district secretary of NSUI. Sequira has often been featured with several high level Congress leaders in Karnataka along with the Chief Minister (CM) Siddaramaiah. With Karnataka elections round the corner, are temple thefts funding elections? “These are not isolated incidents though. India has lost thousands of heritage objects to the international heritage-mafia. Idols, maps, manuscripts, paintings, murals, etc., are looted en-masse and find their way to New York, London, Zurich and other ‘playgrounds for the rich’”. “Hundreds of Jain temples have been looted, with marble Tirthankaras and Jinas commanding a premium in the illicit markets Jains are a peaceful, orthodox people. Unfortunately, heritage-criminals look at this as a weakness,” winds up Saxena. Can we Indians, sit by and let our heritage keep getting destroyed? No! It is time we wake up from our slumber! Featured image courtesy: tweet by Anuraag Saxena. 2. 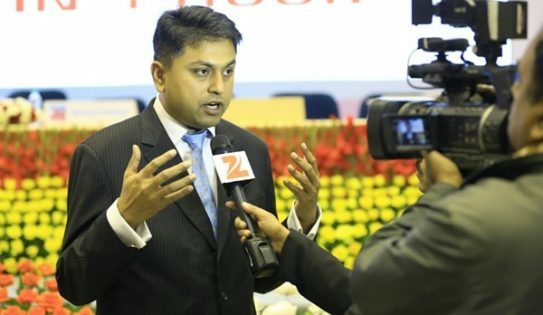 The Plunder of Our Temples and Heritage: Why Indians Don’t Care.